Story by Tessa Hillman re-published in Oct 2013. 10 minutes to read aloud. In my village in India we live very close to the sea. We live in fear of tidal waves, hurricanes, cyclones and even extra high tides. If the people in my village could have found somewhere else to live, they would have. But most people are too poor to move away, so they stay and pray that the sea will not take them before their time. When I was about ten years old, we had a terrible flood. I remember it so clearly. The weather had been bad for several days, raining heavily, turning everything into mud. Then we heard there were storms at sea. The tide was very high the night before it happened. My father said we could not risk staying at home for even one more day. He made us pack our belongings and put them into our handcart. My mother readily agreed to go. She was afraid for our lives, the lives of her children, especially the new baby, only three months old. She felt he would be her last child and so he was especially precious to her. There were six of us children, four girls and two boys. Two of my sisters were older than I was and the others had come much later, they were twins and were about three years old. For me it was quite exciting to pack up all our important things. We did not have very much, but my mother made sure we took our little cooking stove and a large bag of rice along with clothing and bedding and tools for working in the fields. We also took our oil lamp, trying very hard not to break the glass. I wrapped my blanket carefully around it to make sure it was safe. Many other people had the same idea as us; some had already had water in their homes from the previous night’s high tide. The wind blew and the rain fell and we trudged along the road as soon as it was light enough to see. My father said we must walk at least eight miles to get on to higher ground before the next high tide. This was going to be difficult, but father thought that even if we didn’t manage the eight miles at least we would be further inland. Maybe the land would soak up the sea behind us, so that it would not reach us, even if we were still on the low lying ground. My elder sisters and I took it in turns to carry the twins. They were very small and could not keep up the pace. Mother carried the baby on her back and helped father to push the cart when he became tired. After we had been walking about three hours a terrible thing happened, the wheel fell off our cart. People were streaming past us with their children, animals and all their worldly goods. Everybody’s cart was full up to the brim. There was no space for our stuff. Mother began to cry as she looked at her little cooker that she loved so much. Would she have to leave it behind? Time was pressing on. The day was becoming hot and humid and there was still a long way to go. Mother noticed a signpost at the edge of the road. It indicated the way to the next village. “This is a good marker,” she said, and she walked over to a rough brick house. It was open and there were signs that the inhabitants had left hurriedly, leaving little of importance behind them. 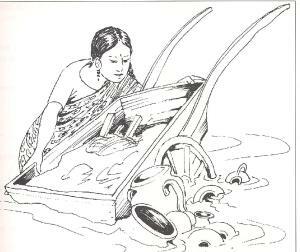 Mother and Father dragged the cart into the house and draped an old sari she found lying in a corner over it to hide the contents. “With any luck when we return we may find this house again and reclaim what is ours,” she said. We continued our journey with no food and no water but with our lives intact. We reached the higher ground two hours before the next high tide and storm. The land was devastated. Thousands of houses were washed away and hundreds of lives were lost. Those too old or too ill to make the journey were drowned. Our family was still together, wet, homeless but together. After five days the local people who had fed us with bowls of rice said we must return to our homelands. There was no room for us in their village. The water had subsided, so return we did. It was difficult to recognise the route we had taken. Dead animals lay strewn everywhere and every so often there was a human corpse. I noticed that several of the dead were people who had a leg or a foot missing, they had not been able to walk fast or far enough. Father found an old wheel abandoned in the road and was hoping to be able to fix it on to the cart, should we ever find it again. My mother suddenly became excited as she saw in the distance the sign near the brick house where our belongings had been left. Mother and I ran towards the house. There were some people standing round the door looking tired and dirty. Mother approached them cautiously. She spoke to a man leaning in the doorway. She explained how the cart had broken and she had left it in the hut. She wondered if it was still there. Mother looked inside the hut. To her joy she found the leg of the cooking stove poking out through a piece of filthy slime. With that the man began to scrape away at the mud. Beneath our cart lay a pile of beautiful cooking pots. He smiled a big smile and his wife looked in wonder at the pots. On returning to our village we cleared away the mud and resumed our lives. That was ten years ago. I have always remembered that man’s understanding of what is mine is mine, what is yours is yours. It is a good way to look at property, and then one will never be tempted to steal it. QUESTIONS: Support answers to questions 2 to 7 with evidence from the text. 2. Why was the village unsafe? 3. Why did the people remain living there? 4. What were the family’s most important possessions? 5. How do you know the narrator had a positive attitude to life? 6. What help did they receive from the villagers on the higher ground? 7. What was the attitude of the man who owned the house? 8. How did you feel when you heard the story? 9. Did it remind you of anything in your own life?